Discussion in 'A Song For You: The Carpenters Forum' started by Chris May, May 2, 2013. I've been needling dropping my original Carpenters LP's and I'm currently up to Now & Then. The design of this LP is very cool but it makes me wonder if Richard and Karen had thought of releasing this as a 2 LP set. The LP cover is actually made perfectly for this....today opening it to get out my original LP I said what a missed opportunity not to include an LP on each side of the flip open cover. It would have entailed recording more tracks most likely but even if they didn't have time to record more tracks they could have opted to use less songs on each side almost like a 45 rpm on an LP allowing for better quality across the vinyl(s). I wonder if this would have worked? LP 1 could still be the pop songs and LP 2 would be the oldies. As I recall, they were sort of stumped as to what material to record for the album that became NOW & THEN, which is why they decided to throw a whole side of oldies on there - and they still needed to fill part of Side One with a soft instrumental. I don't think there would have been enough material for a second full record. But yes, that tri-fold always looked like it should have held more than it did. I could be wrong but wouldn't artists be charged a bit more for designing a tri fold album regardless whether the artist creates a 2 LP set? I would think it would have been cheaper to release a regular open end cover than a huge tri fold. I'm sure money wasn't an option for them at that point, maybe the whole point of the tri fold was for the car and releasing a 2 LP set was not even discussed. Another good question for Richard. Chris May and jaredjohnfisher like this. "Mom Carpenter came up with the title of the album, Now & Then" (July Newsletter). "Album finally released " (June). "Recording day and night for new album, scheduled for release this month..April." (April). "continue work on the next album.."(March). "spending many long hours recording another album." (February). (1) In perusing the Fan Club Newsletters, this album seems to take as much time as usual to complete. time, or inclination, to complete the album as conceived by Richard. which was being used to promote the album. ("scheduled to air in March" and "finally aired May 6th"). Also. "the taping of their own TV special has been postponed temporarily" (May 1973). Ha, true but then the car is also part of the multi fold out covers..it's a toss up. Tri fold covers (some even larger than that) were not uncommon during this period; the absolute height of album cover art (70's). A double album by them in 1973 would have sold very, very well. As I recall, they were sort of stumped as to what material to record for the album that became NOW & THEN, which is why they decided to throw a whole side of oldies on there - and they still needed to fill part of Side One with a soft instrumental. I didn't think so early in their career they were having trouble like that already. I remember Richard said in a documentary once that "it's hard to come up with these things" (referring to full LPs). If that's the case, it makes sense they wouldn't have had the time let alone ideas for an album in '74. Plus explains more of the draggy-ness of what followed. With all considered it makes sense why later releases didn't have the same impact; although, of course they're a treasure for fans! There's a few songs they did Live that didn't make it onto an album, and of course a list of things they left unfinished in studio that would work too. I imagine with the perfectionism they both had it would be hard to find just the 'right' material. Were they kind of in a vacuum when it came to song selection? As in they had little outsider input for what they should or shouldn't record? and, look at the resulting product. the song writers/composers were "writing" songs with "Carpenters in mind,"
thus, the songs were "out there"---Richard was choosing , for whatever reason, to ignore them. 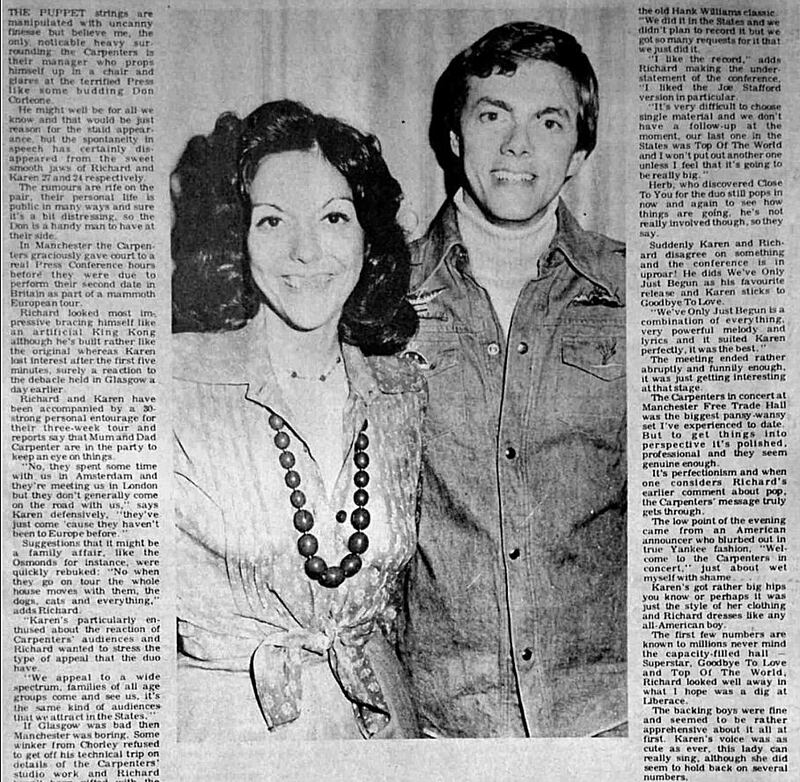 Why--for instance--would Karen Carpenter not be the first choice to record "We're All Alone" ? it was Karen ! Until, you really listened, and realized it was Rita Coolidge singing. Richard Carpenter seems to have passed many a good song by--intentionally. On the other hand--Horizon has some excellent material, "draggy," or not. Don’t forget though, that by the time of Horizon, they were really into feathering their own royalties nest: the album contained no less than 6/10 tracks written by Richard or John (or both) and I’d say four of them fell into the “draggy” category. So he could hardly blame external material for the overall feeling of the album. (1) Good point, although I forgot to add that I never felt Horizon to be "draggy" ! Richard used the word 'draggy' to describe the LP, I believe, in a late 1990's documentary. for LP Horizon, were chosen purposely to "fit" Karen's lower register. overshadowed picking songs from 'external' writing sources ! (As further evidenced by the choice of "b" Side-songs !). Heather -as a song selection, period-places them squarely in the very easy-listening section ! Richard did the same for the tan LP, not including Any Day Now--a great song. (4) Already, then, both 1971 and 1973-- medleys on these albums. Furthermore, the 'live' albums (JP/1972,UK/1976) are Medley-heavy. Now & Then, while a good album, should have been so very much more. Jarred, Carpe diem and MorningOpensQuietly like this. I agree, the fact that side 1 was all covers and side 2 was just one Bettis/Carpenter song followed by what is essentially one long medley, felt like short change to me. After the last three albums, it should have been of a much higher standard. I think both Karen and Richard were a bit more fragile as people than how they appeared from the outside looking in. But then, aren't we all? "to be presented with five gold album awards, two silver disks..."
"two Silver disks , 250,000 UK sales, for Yesterday Once More and Top Of The World,"
"February 24, Talk of the Town appearance"
Now and Then Album sold 110,000 copies in UK by end of 1973 and was 12th best selling Album in UK of 1973. And it was 25th best selling Album of 1974 in UK. Appears on the US Billboard Top 100 Charts: March 10, 1973 , at #19, John Fogerty's Blue Ridge Rangers. And, previous to that cover, many others had covered same. Good cover, yes. Nice enough album cut, yes. Did them no favors, though. 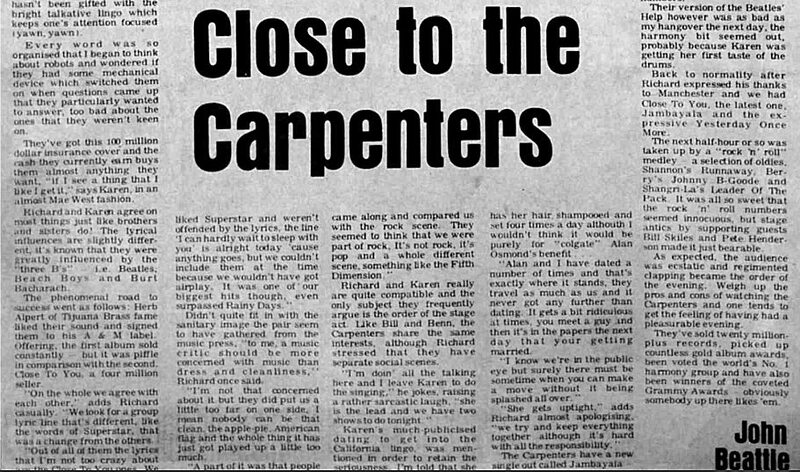 By all accounts of this article, this UK music critic really disliked the Carpenters and pretty harsh to Karen on her looks, I guess this is what they endured back then. Carpe diem and Chris Mills like this. I didn't realize they were still performing so much 50's & 60's music still in 1976? raising a rather sarcastic laugh." If only I had known they were in Westbury in 1974! I was in Bethpage High School at the time, not far away. "The show was too much of a pot-pourri to be rated unforgettable"
This type of criticism must have been frustrating for them - if they'd sung their catalogue of love songs for two hours, critics would have accused them of being bland and boring. I'm not sure what else they could have tried when updating their show, but I know one thing for sure: the Spike Jones and City Slickers routine would have been completely lost on British audiences.